An article published yesterday in the Independent is titled ‘Steve Reich: ‘Rock was pretty much off my radar – then along came Radiohead’. It’s interesting that one of today’s most eminent composers would still even consider a genre to be off his radar, but then a wish to discover new music is perhaps what makes a composer interesting, innovative and able to take their work in a new direction. To what extent is modern music à la Reich on a GCSE music student’s radar? 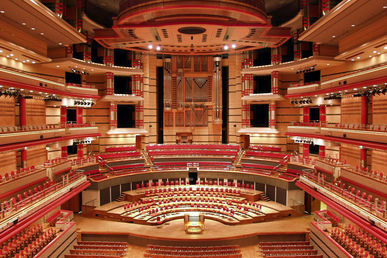 This week 36 students from a local Ladywood school, George Dixon Academy, will feature in two concerts: Beyond Classical: Minimalism Special and Repeating Patterns – a London Sinfonietta schools matinee concert. Through a series of school-based sessions, students have been working with renowned percussionist Joby Burgess and supporting music undergraduates to produce a new Reich*-inspired minimalist composition, the aptly named Reich Rewrite, that they will be performing in both *Symphony Hall Cafe Bar and on stage at Town Hall. With a modest six sessions before the premiere of Reich Rewrite, Burgess was tasked with enhancing the students’ knowledge of minimalism that they may have heard through pieces like Reich’s Electric Counterpoint (via Edexcel curriculum), but had limited experience of through practical work. Reich Rewrite is the product of that practical music-making process, educating students via their own collaborative work, gauging where the students’ talents and interests lie and working creatively in that direction. Reich’s famous ‘from Chicago to New York’ voice sample in Different Trains led to ‘from Birmingham to Winson Green’ as students recorded their own familiar journey, the rhythm in Clapping Music was amazingly easier to clap or drum on djembes when chanting ‘‘i-like-tea-i-don’t-like-coffee’‘, and grooves in Electric Counterpoint inspired vocal harmonies from talented young singers. All of this has in some way been pulled together into Reich Rewrite, and if minimalism wasn’t really on this GCSE group’s radar before, it certainly is now.